This Rudolph Chocolate Tartlets recipe is not my own original creation. I got it from a magazine in Australia, but I thought others might like to give it a try. It's really cute and festively fun! I enjoyed making it for my own kids and I hope you enjoy it, too. Here's a little tip: This recipe calls for Arnott's Butternut Snap Cookies, but you can really use any similar cookies that are available in your area if you can't get your hands on these. Preheat your oven to 180 degrees Celsius (160 for fan forced), or 350 degrees Fahrenheit. the cookie is soft enough to reshape. Take a ladle, a lime, or something oval shaped and carefully press the now soft biscuits into the tin to make a cup shape. Once they've cooled place them on a plate ready to assemble. To make the chocolate filling, combine the butter, cream and chocolate in a saucepan over very low heat. Stir constantly for about seven minutes or until the chocolate is melted and smooth. Pour the mixture into a clean dry bowl and refrigerate for about 20 minutes or until cool, but not completely set. Remove chocolate from the fridge and fill each biscuit with a heaped teaspoon of the mixture. Return to the fridge for 20-25 minutes or until the chocolate is set in the cookies. Press 1 of the large marshmallow halves, cut side down, near the bottom edge of each tartlet. Use the ready-made frosting as glue to attach a red Jaffa candy for Rudolph's red nose. Push 2 mini marshmallow halves above the nose to form eyes. Add 2 of your pretzel pieces above the eyes and press them into the chocolate to secure the antlers in place. Enjoy! 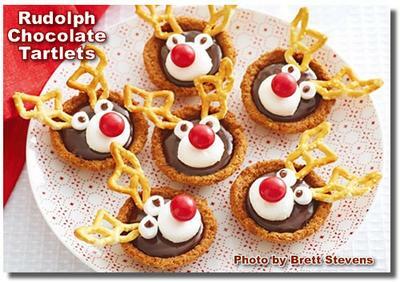 These Rudolph Cookies are such fun and the kids will love them. Thanks for adding your Rudolph Chocolate Tartlets. You're right! They really are adorable and I know the kids will love them. I did edit the recipe slightly to help my many American friends make something similar. I know they won't want to miss out. Hope you, Mike, and the kiddos have a wonderful Christmas. Join in and write your own page! It's easy to do. How? Simply click here to return to Your Favorite Christmas Candy.